LOS ANGELES -- I remember it so well, an event that was seared into my brain the way good memories and milestones are. Only this one is a nightmare that haunted me from sometime. It was May 13, 2004. My beloved San Antonio Spurs, then the defending NBA champions, were hosting the Los Angeles Lakers in Game 5 of the Western Conference Semifinals. And with .04 seconds left to play, the Spurs took a 73-72 lead and were well on their way to go up 3-2 in the best-of-7 series. But a minor miracle got in the way. Against both a quickly thinning clock and a relentless defensive pressure off the inbounds play, Derek Fisher sank a Hail Mary turn-around jumper that gave the Lakers an improbable 74-73 win. A game later at the Staples Center in LA, with Shaq and Kobe in full-throttle, the deflated Spurs were dethroned. As a lifelong Spurs fan, who had worshipped at the altar of San Antonio's teamwork and unselfish play, the stunningly tragic turn of events morphed into one of the saddest chapters of my sporting life. But it was easy to get over with it when head coach Gregg Popovich guided Tim Duncan and company to two more NBA championships in 2005 and 2007. And while fans tend to hate opposing players who have crushed their hearts, I've never developed anger nor resentment toward the diminutive Laker guard. Fish, as he is called by his peers, was simply doing his job when the moment demanded it, I surmised. Besides, Fisher is universally regarded as a friendly, blue-collar guy who is so easy to like. And I gladly found that out myself when I met him in person during one of my few visits inside the Lakers locker room this past regular season and playoffs. A 15-year NBA pro, who spent most of his career with the Lakers plus brief stops in Golden State and Utah, Fisher has compiled 29,208 playing minutes, 3,470 assists and 2,378 rebounds. With a career total of 9,763 points, he has made 1,095 3s and 1,878 free throws. Fisher also has 88 shotblocks, which certainly is not bad for a guy who's just 6-foot-1, 210 pounds and a mere 24th pick in the 1996 NBA draft. Fisher, nearing 37 years in age and obviously in the twilight of a wonderful career, is even better in the playoffs. His averages in 209 postseason outings seem small, 8.9 points and 2.6 assists per. But his clutch play, hustle and defense are immeasurable. 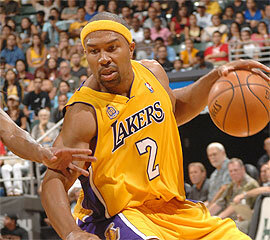 A five-time NBA champion, Fisher was especially stellar in the 2009 NBA Finals, shooting 50 percent from the field and 44 percent from 3-point range. A product of the University of Arkansas in Little Rock, Fisher owns a degree in Communications and he is waging a bigger battle these days as president of the union representing NBA players. Despite the hurt he inflicted upon me once, I am rooting eagerly for Fisher this time, hoping that he would help end the ongoing NBA lockout. I wish I could articulate the whats and whys of the NBA labor wars, but it's complicated. In the simplest terms, however, I can tell you that the NBA is having a work stoppage because the existing Collective Bargainng Agreement (CBA) between the billionaire owners and the millionaire players expired last June 30. Right now, there's just a whole lot of bargaining and no agreement.